Two new potential names for Samsung’s foldable flagship device have been spotted: Rize and Fold. The first name was found in trademark applications made with the Intellectual Property Office of the United Kingdom (UKIPO) and the USPTO. “Fold” has surfaced in another trademark filing, this time associated with the Turkish Patent and Trademark Office (Turkpatent). 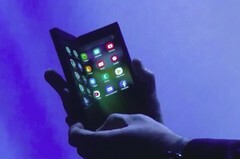 The upcoming foldable phone from Samsung has created a lot of buzz about how it will look, what kind of display it will feature, and what specifications it might offer. There also seems to be plenty of debate about what name it will have, with two more contenders joining the growing list of possible monikers. It seems Samsung can now choose from Galaxy Flex, Galaxy X, Galaxy F, Samsung Flex, Galaxy Fold and Samsung Rize. The Samsung Rize name, pointed out by LetsGoDigital, has been registered with the UKIPO and USPTO. The Nice classification for the trademark is 9, which covers a multitude of goods from abacuses to non-medical X-ray photographs. This class also includes smartphones, wearables, tablets, and laptops – so it could be reasoned that the Rize name isn't even reserved for a smartphone. However, notes in the filings point to the specific sub-classes "smartphones" and "mobile phones". The filing for the Samsung Galaxy Fold name, spotted by 91mobiles, is even more curious. It includes the specific Galaxy series name, and it has been filed with Turkpatent. Some sources seem to have mixed up the applications for the Rize and Fold names, but they are distinct and different filings. Again, the application comes under Nice class 9, but the note for this record, when translated from Turkish, mentions products such as smartphones, tablets, portable computers, and wearables. To quote Winston Churchill, it seems that the actual name for the Samsung foldable smartphone is “a riddle wrapped up in a mystery inside an enigma,” at least for the time being.